The insistence of AIG to pay $450 million in bonuses dominated the news today. There are a few things that can unite Republicans, Democrats and even libertarians. Well, pretty much every sentient carbon based lifeform in the US is seething. While the villains of the hour are clear, it is important to remember that at this critical junction in US history, we also have quite a few heroes. Take for example, Beth Israel Deaconess Medical Center. While we want to (rightfully) vilify AIG, we also should to celebrate the heroes. So how can the Obama administration prevent AIG from awarding taxpayer funded “bonuses” to a handful of AIG executives and traders for nuking the global economy? I’m sure there are other, more creative solutions, so let me know yours. I have a better idea: bankruptcy. The government is entirely at fault do to their decision to bail these companies out rather than do a packaged bankruptcy. The feds have no legal basis to change people’s employment contracts after the fact. Absolutely none! Do you have any idea the sort of precedent this sets? What will keep the government from taking over *your* employer and halving your salary after you’ve put in the work? IMHO, the bonus should be linked to their performance. How could they sign such contracts by giving them bonus without considering their performance? Actually they should be punished for their lousy performance and get laid off! Peter, AIG is a big company. If you worked in one department and put in long hours doing great work and then some group of a-holes in another department (that you have ZERO control over) lose a pile of money, then how is that your problem? I personally would never work for commission (which is what these so-called bonuses actually are). Let them settle up with God. AIG gets money to avoid bankruptcy and turns around and rewards those that are part of the creating this meltdown because they had no choice - the employees were entitled to the bonuses because of a legal agreement. GM gets money to avoid bankruptcy (caused by in large part by AIG) and the CAW workers have to take renegotiate their legal agreement (ie. their contract) to take a pay cut and lose their benefits. I guess it all depends who you are - management will always look after their own. That didn’t take long! They’re tripping over each other to get the bills sponsored. The first seems to by by Steve Israel to tax the bonuses at 100% (one of the suggestions in the post). 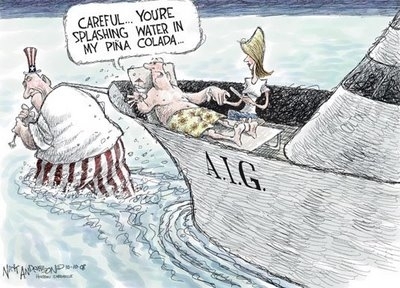 I say bravo to AIG! If I were smart enough to scam the stupid government out of a ton of money, I would give all my top executives massive bonuses and fly them to Vegas for a long weekend of debauchery. The government is now bitching and moaning about how AIG spends their money as if the government is so frugal and wise with the trillions they waste. Give me a break. What a bunch of hypocrites. we don’t want to be a country bound by contracts and the rule of law. that’s so antiquated. we need to have the freedom to take polls about whether people should be paid or not. if a poll says they shouldn’t, then don’t pay em. it’s the democratic way. it’s the only way to have a socially just country. i would like to commission a poll on whether tradersnarrative should be allowed to exist. personally, i don’t think it should, but i need a few more votes to allow me the latitude to shut it down for good. tradersnarrative is an outrage! 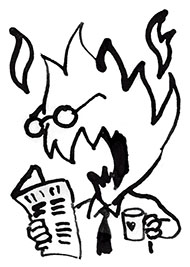 yo, I’d be the first to second your motion… had tradersnarrative engaged in any activity even remotely similar to AIG. Namely, nuking the financial system, generating billions in losses and then getting paid handsomely for it and on top of it, demanding a bonus payment!